BLUES IN THE District kicks off tomorrow at 5:30 p.m. in Washington Park. Hurricane Ruth is here to get us started for another strong season - click here for the complete lineup. 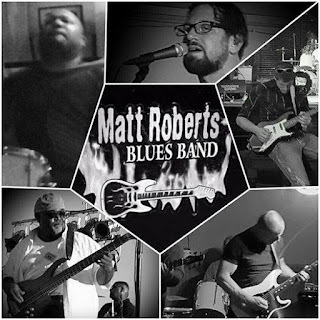 Second String Music is especially fired up to sponsor The Matt Roberts Blues Band on July 28. In fact, you can head down to the Club Tavern on 10th between Chestnut and Cherry to catch Matt and the boys this Friday night after the Blues In The District show is over. It ain't easy to get off the sidewalk and venture into the park for Blues In The District, but we'll make an effort. Promise. Every Friday for lunch, we have local acoustic artists putting on shows in Washington Park. We start tomorrow with a special show - Jaki Kaufman starts at 11:15 a.m. and Bella Song plays about an hour later - and just like Blues In The District, it's free and open to the public. The Butcher Block will be right across the street from us at Fifth and Maine to serve lunch. Here's the lineup for our noon shows. It's in the shade and the music is awesome, so please come down and support live and local music! All shows start at 11:30 and go until 1 p.m., except for tomorrow. We will have more info on the Quincy Park Distirct's Summer Concert Series, but here is the lineup. Each show starts at 6 p.m. in Washington Park (Madison Park's lack of trees from the storm two years ago prompted the move downtown).